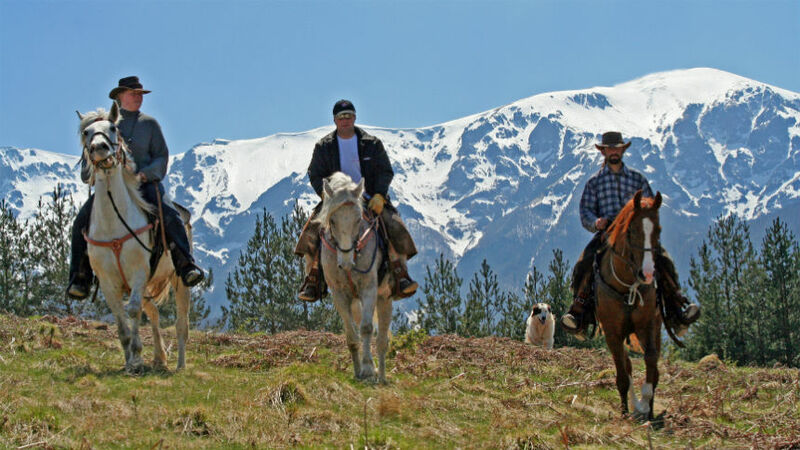 Horseback Riding In Bulgaria - Balkan Trail. Equestrian Mountain Holidays. Treks On A Horseback. Have you ever been on a ride along ancient trails over impressive mountains, through waste mountain passes, along romping streams and roar waterfall? And further in the wonderful mountain scenery crossing the pasture to small hidden and forgotten villages? If not why don’t you join us on this exciting holiday, where every day brings new challenges, new terrains, new riding experiences and impressions on Bulgarian nature and culture… This is an adventurous ride for riders wishing to try everything. This is possible because here we combine trekking from place to place with our riding bases in the mountains. The tour is following the ancient trails that for hundreds of years have connected the North of Bulgaria with its Southern parts across the Balkan Mountain, which lies as a backbone along the territory of Bulgaria. Starting from the charming town of Apriltsi, scattered among the rolling hills of the Fore-Balkan parts of the mountain, the route climbs up towards Mt. Botev (2376 m a.s.l. ), descends on the southern side of the mountains reaching the Valley of Roses and Sredna Gora Mountains before going back along a different track. The daily rides range between 6 and 8 hrs. Day 1. Welcome meeting at Sofia Airport and transportation to the riding base in the Balkan Mountains. Day 2. In the morning you will meet your horse for the first time and will be able to fall into your horse’s ways during the introduction ride in the vicinity of Apriltsi. We know that trust between rider and horse is something that takes time to be built but still the very first steps are the most important and we will do our best to create a firm friendship between both sides. After lunch in the base the trek continues up in the mountains for appr. 3 hrs until we reach the first chalet. Day 3. The ride continues through the ridges of the Central Balkan National Park and the foots of Mount Botev (2376 m). From the highest parts of the mountains you will be rewarded with remarkable sceneries towards the vast lowlands of the Thracian Plain. After 6-7 hrs ride we will end up in a small monastery where you and your horse will find rest for the night. Day 4. In the morning you will have some time to explore the monastery life and the small town of Kalofer nearby. The legend tells about the founder of the city (called Kalofer) that he made an agreement with the Turkish sultan about guarding the mountain pass if on the other hand the sultan could guarantee that no shoed horse or weapon would enter the town. After lunch we continue through the Valley of Roses and after some 5 hrs we reach the Sredna Gora Mountains where we spend the night in the chalet Svezhen. Day 5. A whole day, meant to devote your attention to riding in the terrains around the riding base. Play, fun and games with the horses combined with needed relax at the banks of a small lake nearby – a really exciting experience. 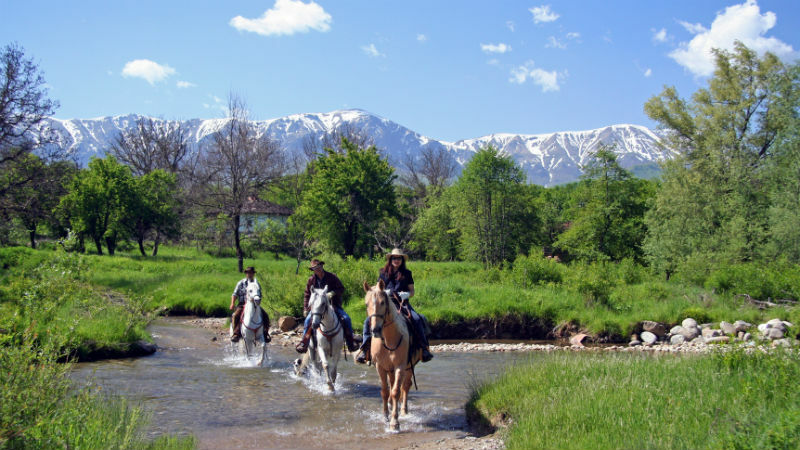 In the lush meadows you will have all possibilities to break into trot or gallop or to be a pathfinder together with the riding guide in the remote surroundings. You will also have time to explore the village of Svezhen, which is declared an architectural reserve. It resembles an open-air ethnographical museum and you get the feeling that time here has stopped many years ago. Day 6. Time to head north again. After 7hrs we will reach the place where we will stay for the night. Day 7. As we approach the end of the trek we must continue on to Apriltsi, where we get in 6 hrs ride. Farewell dinner in the evening. Day 8. Transfer to Sofia Airport for departure. Transfer from/to Sofia Airport is organised as one transport for all arriving and departing guests. We recommend arrival not later than 18:00 and departure not earlier than 12:00. The transport is planned after latest arrival / first departure in the group; All guests must be in a possession of an insurance covering your riding holiday in Bulgaria; There are more than 25 horses in the riding base – all of them in good condition and trained to ride in the mountains; Most of the horses are of the East Bulgarian breed and crossings with Arabians and local horses; The East Bulgarian breed is well known as tough, thoughtful and wise, and in harmony with the famous strength and power of the Arabian it gives a combination that fully satisfies the riders and the challenges in the nature; The average size is 160-165 cm. The saddles are Western (Australian or American). There are small saddlebags. Do not miss a unique chance to prolong your stay in Bulgaria with one week more at anincredibly low price! We can offer a great variety of accommodations - from home stays (no meals) to 2, 3 and 4-star hotels (BB or HB) in the most famous summer resorts along the Bulgarian Black Sea Coast, namely Sunny Beach, Sozopol, Nessebar, Golden Sands etc. Please contact us for more details. Accommodation: The Balkan Trail is based on 7 nights. 2 nights with private accommodation in Apriltsi (en-suite rooms), 4 nights in chalets (double or triple rooms, WC/toilet on the floor), and 1 night in monastery (double rooms, WC/toilet on the floor). The trail is with full board during stay and only beer, wine and alcoholics are paid on spot. The luggage is transported in a supporting vehicle and the riding guide is accompanying the party throughout the trail.